When I was growing up, it was always a treat to have tacos for dinner. For a while we would do this on Sundays. My mother would line the table with fun toppings, ground meat, and taco shells. In our house, we make tacos from time to time. When we use real meat, it is often ground turkey. Typically we use burger crumbles that are soy based. If we do this, we can use real cheese for our kosher dining. With burger crumbles we can also experiment with other recipes that can be found on web sites like Betty Crocker that include meat and dairy. Recently we were asked by MyBlogSpark to try out some Old El Paso products for our family taco night. Since it seemed like a fun idea, we jumped at it. I have to apologize that I do not have any photos. Our trial happened during the time that both of our cameras were not working and the new ones were being shipped. Our boys are not big taco fans. To be honest, JSL (3) is a VERY picky eater in general. When we make tacos, we can usually coax NHL into eating the meat and other items that we have, but not always together. TechyDad and I like to make Taco salads. We use the Old El Paso 40% less sodium seasoning with our meat of choice and add in black beans and corn. We put this mixture on top of a big plate of lettuce, toss on some low fat cheese, and then some salsa. A filling meal that satisfies our Mexican food cravings. One other perk with Old El Paso products is that they contain Box Tops For Education. So you can earn money for your child’s school while you feast. To add to the fun of family taco night, you can visit El Tacodor, the world’s only family taco night game. With El Tacodor, you can share a special night at home by challenging one another to a quick fire trivia, wordplay, and pantomime. Head over to El Tacodor to download instructions, a score card, and a challenge sheet so you can begin your fun. 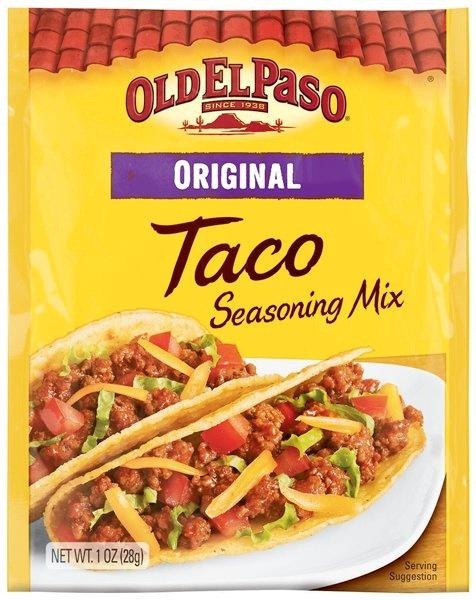 You can also visit here to download a printable coupon for $0.60 off any two Old El Paso products. Thanks to MyBlogSpark and Old El Paso, one lucky winner will receive the following taco night pack like the complimentary one I received. 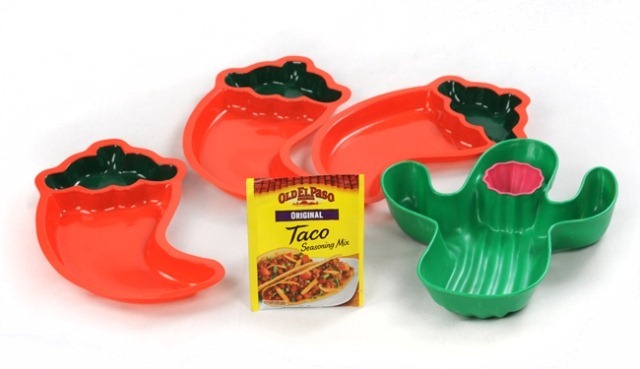 The Old El Paso taco night prize pack includes a packet of original Old El Paso Taco Seasoning, a Cactus Chip & Dip Serving dish, a set of 3 Fiesta Chili Pepper serving dishes and a $10 gift card to purchase your taco fixings. MAIN RULE – What is your favorite part of family taco night at your house? 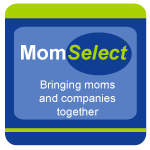 1 Bonus Entry – What is your favorite non-taco Mexican dish to make for your family? 1 Bonus Entry – Leave a comment on any of my non-giveaway posts from the month of December. Leave a comment here to let me know which one. This Bonus entry may be done only twice per person. To enter, please follow the rules above within the comment section. Contest starts today December 16 and ends at 10:59 EST on December 28, 2010. You do not have to be a blogger to enter, but must leave a valid e-mail address for me to contact you for mailing address once the giveaway is over. I will select the winner using random.org and contact you via e-mail. You will have 48 hours to claim the prize. If there is no response, another winner will be selected. Open to U.S. residents only. Disclosure: I wrote this review as part of a MyBlogSpark campaign for Old El Paso. My family received the complimentary taco night kit and another will be provided to a winner of the giveaway. 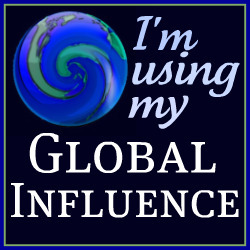 All opinons are my own and no other compensation has been given. Taco night is family game night we have a blast making tacos and then enjoying a fun game…. We love the togetherness, the great food, and the good movie we choose to watch with dinner! We love nachos with guacamole on top! My fav part of taco night is everyone being creative and making their own taco! My favorite mexican dish to make is chicken enchiladas! What I like about Taco Night is that it is an easy way to serve leftovers. My favorite mexican dish to make is chilles rellenos. Thank you to everyone that entered. The giveaway is closed and the winner will be notified and announced in the tab found above.